High contrast is the easiest of the contrasts to master as it’s the most obvious. You can find out how to discover your contrast here. Working with low contrast here and medium contrast here. Here we have an achromatic (black and white) high value contrast. A monochromatic (one colour) high value contrast. A complementary (high colour contrast) outfit. The bright colour with the dark colour can be used to replace a light/dark value combination if you wish. Click here if you are reading this in an email to see how to work with high contrast patterns. 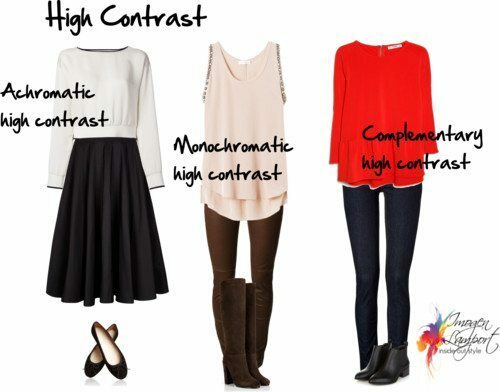 In the post on how to dress medium contrast, you said that we can go one level up or down from our native color contrast. Does that rule hold for value contrast also? Also, a question about the complementary high contrast outfit and using color to create contrast. I would say that’s a medium value contrast – dark pants + medium top. Would a red top + bright blue bottom (both medium value) also work to create the right contrast? With value contrast it’s best to stick to what is best for you. Red and blue will create a higher colour contrast so will make you look moe contrasted, but depending on your colouring may or may not work for you. interesting – and how do you make someone more authorotive if someone has a low or medium value contrast? I second Tina. I have been thinking about the same. Value contrast seems so important, yet say someone like Nicole Kidman who has soft light warm colouring, low value contrast; she puts on even medium value contrast, the clothes wear her, she simply would not look as good, there’d be no harmony. To be honest I feel the same way about darker colours. Even with a darker colour that is soft and warm, if someone is blond with v pale skin and eyes, nothing dark will ever suit them as much as something lighter imo. finally, while you have often said that personality trumps everything, unfortunately I don’t see how it can be true. 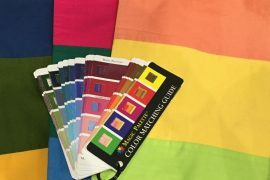 aesthetically, the colours that suit you best will always make you look healthier and more radiant and better put together than the colours you simply like. it’s physics and science, isn’t it? not fair, but true. When I say personality trumps everything, ususally it’s a very dramatic or creative who can wear clothes/contrasts outside of their natural harmonious range. I wouldn’t say Nicole Kidman is one of these! But say a Kelly Osborne could easily get away with going higher contrast than her natural colouring as she has a larger than life personality. Thanks – so someone with medium colour and value contrast wears then, although it isn’t the best option, light and dark colours together? Because medium and dark together is what I do nevertheless. Can you also show more authority if I wear light and medium colours and use more yang elements? Thanks! I have noticed that a dark neutral + bright medium color works for me, even thought technically the value contrast isn’t high – now I know why. That gives me more options with my current wardrobe. Thanks for this contrasto series. I had noticed I look better with a dark bottom and bright top, or viceversa, but couldn’t figure out why. Now I know it depends on my contrast. Imogen, this was helpful, especially I hadn’t considered the bright color with dark pants to create contrast. I have a question though, mostly these include light colors on top, with darker on the bottom. What if we look best with deep colors near our face? I don’t think light pants are as flattering, especially on those of us with big hips/buts, so what would be the best way to achieve high value/low color contrast in that case? Even if you are deeper you can wear light colours near your face, or use a pattern, an accessory to create the lightness, or even a cami! I love how so many of your posts feel like they were created especially for me. You have given me more ideas to use when putting together outfits for my high contrast features. Thanks Brittany! I’m glad that you are getting so much from them. Ah thank you for this Imogen. I can now see why everyone said I looked fantastic and so well in the summer when I wore a white and bright royal blue dress. Amazing really as at the time healthwise I was not feeling my best! 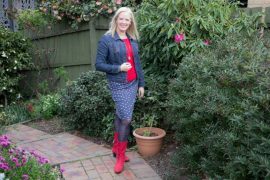 I love it when we realise why an outfit really works! Then it’s easy to replicate. Also thank you for saying about being able to wear Bright colours with dark colours as a High value person. I have been doing this as it’s what I like but have never found anyone who really knows to confirm my thoughts. I wish you lived in the UK! Thanks Anne! I’m hoping to get to the UK in 2016! Thanks Imogen for this series. Actually I am all light coloured, but have I high color contrast (orange hair, blue eyes). Do you have exemples of that? There is an example of that in this post https://insideoutstyleblog.com/2014/11/real-life-examples-of-dressing-to-your-contrast.html of orange hair and blue eyes. Imogen, my friends say my contrast level is medium to high. How should I combine my colors? If I wish to wear a high contrast outfit, will I need to add a medium color in there to make the outfit work for my coloring? Thanks. 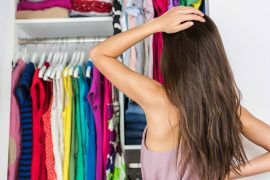 Have you had a look at this post for examples of outfits https://insideoutstyleblog.com/2014/11/real-life-examples-of-dressing-to-your-contrast.html If you have high contrast, then you can easily wear high contrast without adding a medium colour. Otherwise, a medium/high contrast may be all you need to look high contrast. What do you mean by medium/high contrast. How do I accomplish that? Thanks. I often wear monochromatic high contrasts because its suit my personal style the most (wore something similare recently, darkbrown pants, cognac tall boots and beige ruffled blouse, plus a coral-red cardigan and I often wear pastels with black or navy) but high color contrast but lower value contrast works well as well. 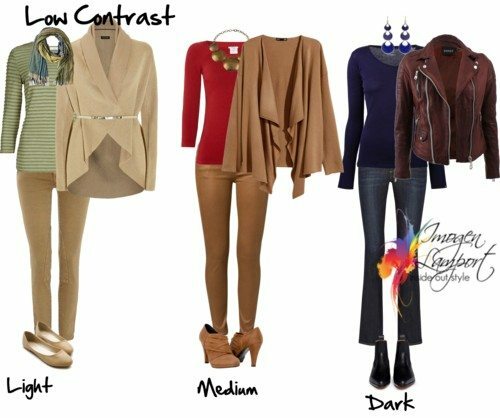 While Low value and low color contrast together or wearing dark color head to toe are combinations are what tends to wash me out. But brights are really confusing when trying to deciding the value contrast, because brights looks all the same to me when it comes to shade/tints unless its a flouroscent color. Although Ive a muted colorings, I prefer to wear wintery colors like ruby, royal blue, violet, emerald etc. But I dont consider them “dark and bright”. 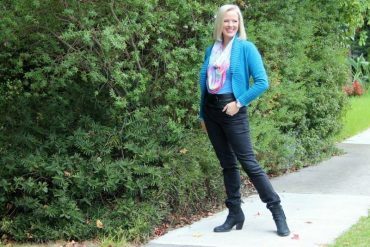 Like if wearing a light neutral (lightgrey, beige/camel, etc) cardigan with a black top and bright blue pants – what value contrast would that be compared to the navy jeans and red top? There are darker brights, medium brights and lighter brights. So a darker bright won’t create as much contrast as a medium bright or lighter bright.